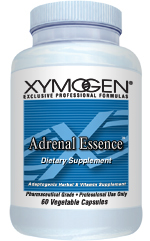 What it’s for: Adrenal Essence is a dietary supplement that helps to eliminate the harmful effects of stress and fatigue on the body and may increase the efficiency and effectiveness of the body’s immune system. What’s good about it: The pills are small and easy to swallow. Also, the standard dosage of one pill in the morning and one in the evening is easy to manage with my work schedule. What’s bad about it: The label contains a warning not to take it if pregnant or breastfeeding. The label also recommends consulting your physician before taking this supplement if you are currently taking any prescription medication or receiving medical treatment. It’s better than: The stress tablets that I used to take years ago. Those tablets contained B-complex and Vitamin C. Adrenal Essence contains so much more: Vitamin B-6 (as pyridoxine HCl), pantothenic acid, cordyceps sinensis extract, rhodiola rosea root extract, PABA, and ginsenosides (as panax ginseng root extract). These substances are known as “adaptogens,” which help the body to adapt to stressors, reduce stress reactions, and help the body to return to the state of balance known as homeostasis. It’s not as good as: Removing all stress from your life and enjoying perfect tranquility 24/7. However, as a middle school teacher and mother of nine, I expect a certain amount of stress to accompany my blessings! Why I use this product: When I first came to Dr. Rogers because I had been diagnosed with severe osteoporosis, he examined my blood microscopically using a dark field viewer and found evidence of severe adrenal stress. He said that part of the adrenal stress was likely due to my choice of career and my active home life. However, he believed that my adrenal glands were “basically shot” mainly as the result of consuming the highly acidic, standard American diet and from not sleeping enough. He ordered a complete change of diet to the alkaline diet featured on this website, and he prescribed Adrenal Essence to rebuild my adrenal glands and improve my immune system. Dr. Rogers said these were essential first steps in helping my body reverse my osteoporosis and begin building bone density. Best place to get it: Phone Xymogen at 407-445-0203 or 800-647-6100. Can your DNA be fixed for $100 per month? I take Adrenal Essence and find it helpful. I have lupus and hypothyroidism and it helps with the fatigue and motivation. BUT it is not a small capsule, I wish thay make it smaller, I generally do not have problems with pill taking but these capsules tend to get “stuck” in my throat. but they are worth taking.